If you like to see the images and apps status on the Lock screen, but the display goes black in about a minute, then use this guide to change the Lock screen timeout setting on Windows 10. In this Windows 10 guide, we'll walk you through the steps to tweak the Registry (or Command Prompt) to customize the operating system should way until turning the display off, which will give you more time to see the background, status, and interact with Cortana on the Lock screen. Important: Before diving into this guide, it's worth noting that editing the registry can be dangerous, and it can cause irreversible damage to your system if you don't do it correctly. It's highly recommended to make a full backup of your PC before proceeding. On the right side, double-click the Attributes DWORD. Use the Windows key + X keyboard shortcut to open the Power User menu and select Power Options. Click the Change plan settings link for the selected plan. On Advanced settings, scroll down and expand the Display settings. You should now see the Console lock display off timeout option, double-click to expand. Change the default time of 1 minute to the time you want, in minutes. Once you complete the steps, you can test the new settings by locking your computer (Windows key + L keyboard shortcut), and now the screen shouldn't turn off until the time you set expires. At any time, you can revert the changes by following the previous steps, but this time, on step 4 change the registry value key from 2 to 1. The beauty of Windows is that you can configure the same feature in a number of ways. Alternatively, you can use the PowerCfg.exe utility to change you display timeout setting when your computer is locked. When it's connected to AC power or when your device is running on battery (DC power). Important: You must change "60" in the command-line with the timeout time you want to use, in seconds. For example, if you want the screen to turned on for 5 minutes, then you need to use 300 at the end of the command. 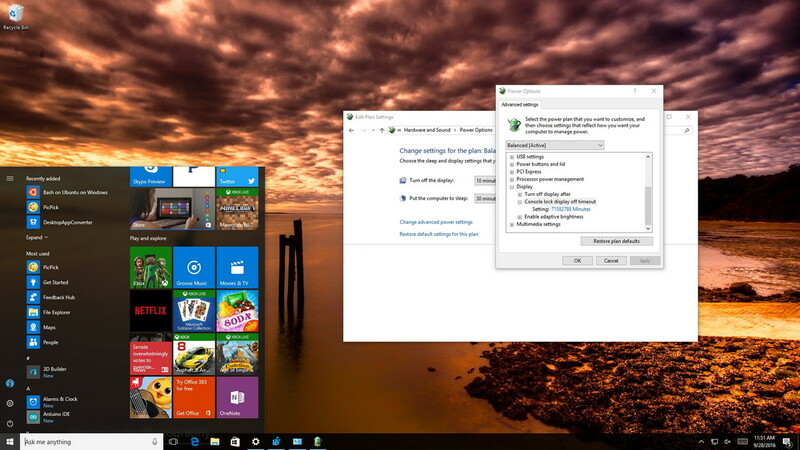 Use the Windows key + L keyboard shortcut to lock your PC and see if the new settings work. The command mentioned in step 2 will work when your computer is using AC power. You must replace /SETACVALUEINDEX for /SETDCVALUEINDEX if you want to change the timeout setting on your laptop or tablet running on battery. It's worth noting that while changing the Registry settings is an advanced task, during my test, I have found that sometimes using the command lines may settings may not work as expected, but it's an alternative. On the other hand, changing the Registry worked perfectly, and after making the tweak, I can simply go to the Power Options settings in Control Panel and adjust the Lock screen timeout without having to use any commands.